Good news! 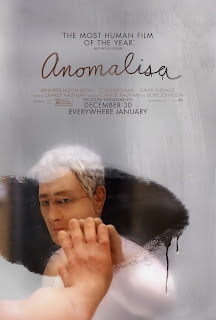 Flaming Medusa Animation hooked us up with a cool deal that means you can get free advance screening tickets to the Academy Award nominated stop-motion feature "Anomalisa". Michael Stone, husband, father and respected author of "How May I Help You Help Them?" is a man crippled by the mundanity of his life. On a business trip to Cincinnati, where he's scheduled to speak at a convention of customer service professionals, he checks into the Fregoli Hotel. There, he is amazed to discover a possible escape from his desperation in the form of an unassuming Akron baked goods sales rep, Lisa, who may or may not be the love of his life. A beautifully tender and absurdly humorous dreamscape, from the brilliant minds of Charlie Kaufman (SYNECDOCHE, NEW YORK) and Duke Johnson ("Community" episode, Abed's Uncontrollable Christmas), this stop-motion animation wonder features the vocal cast of Jennifer Jason Leigh, Tom Noonan and David Thewlis and a stirring strings-based score by Carter Burwell. The darkly comedic and surreal stop-motion journey of a man's long night of the soul, ANOMALISA confirms Charlie Kaufman's place amongst the most important of American filmmakers, and announces Duke Johnson as a major creative force.